Just a short boat ride away from the docks in Puerto Villamil on Isabela Island in the Galapagos lies Las Tintoreras, a group of rocky volcanic islands. The islands are surrounded by coves where white tipped reef sharks live. The sharks are called “tintoreras” in Spanish. You can only visit Las Tintoreras with a naturalist guide, so I signed up for a tour with Pahoehoe Tour Agency, which cost around $55. I met my guide at the tour agency and we boarded a chiva (a rickety open-sided bus) to go to the docks. On the chiva was a land-based tour group and their guide. After a 5 minute drive along the sandy main road, the chiva arrived at the main docks. A sleepy sea lion on a bench peeked at me as I walked by. Two more people joined the tour and we all boarded a water taxi to Las Tintoreras. On the way there, the captain spotted a group of blue-footed boobies and later a few penguins on some rocks. He circled the boat around so that everyone had a chance to take photos. Every time they saw penguins or blue-footed boobies, several tourists in the boat would leap up from their seats in excitement, causing the boat to sway and rock. “Please stay seated!” the guides had to keep shouting. Once we landed on Las Tintoreras, the land-based package group went off with their guide and the two other solo travelers and I followed our own guide. We walked along a path surrounded by black lava rocks. At first, I didn’t notice the piles and piles of marine iguanas perched on the rocks – they blend in so well. We saw so many different sizes of iguanas- baby ones, medium ones and large ones! The guide even showed us an iguana carcass which was slowly decomposing in the sun. We peeked into a lagoon full of white tipped reef sharks- Las Tintoreras! Some were sleeping in caves while others were swimming around slowly. Although they look scary with their sharp teeth, white tipped reef sharks actually aren’t dangerous to humans. They feed on fish and small octupus. After stopping at a bay to watch a few sea lions splashing and playing in the water, everyone headed back to the boat. It was time for snorkeling! I had my swimsuit on under my T-shirt and shorts, so I took them off. I reached for my wetsuit, but my guide said, “You can change on land, not in the boat.” I’m not exactly sure why, but it could be because he didn’t want the boat to sway while people struggled to put on their wetsuits. So all the snorkelers stepped off the boat onto the lava rocks, which were hot from the heat of the sun. Luckily I had sports socks on, because the rocks were sharp! I don’t recommend walking barefoot on them. I took my wetsuit out of the bag and started pulling it on. It was still slightly damp from my snorkeling trip to Los Tuneles the previous day. Now putting on a damp wetsuit isn’t an easy task. Putting on a damp wetsuit while standing on sharp lava rocks was even more difficult. Finally, I managed to get it on and zip it up. I felt so accomplished! “Well…thank you very much for letting me know.” I said sheepishly. So I had my wetsuit on backwards during the entire tour yesterday, and nobody told me??? I struggled out of the wetsuit and put it back on again, this time with the zipper on my back. Another solo traveler and I helped each other zip up our wetsuits. Even though I can swim, I’m not used to swimming in the ocean, so I put on a life vest over my wetsuit. The group started getting their masks ready by cleaning them with their spit. Then a woman took out a small bottle of liquid soap and offered some to everyone as an alternative to spitting. I gladly took her up on the offer. The package tour guide from Pahoehoe (my own guide was standing on the boat, watching us) gave a safety briefing before we got into the water. I froze in horror. Sea urchins? Spikes? I felt like stripping off my wetsuit and running back to the boat. As the members of the group started to get into the water, some of whom didn’t know how to swim or had never snorkeled before, I hung back, looking worriedly into the water. A few days earlier, while snorkeling at the beach on Bartolome, my flipper had fallen off and I had cut my foot on the rocks. That was only my second time snorkeling. My third snorkeling experience at Los Tuneles had gone very well, but feeling nervous in the ocean, I had needed to hold onto the guide most of the time. So because of my previous injury and inexperience, I still felt nervous about snorkeling. I sat on a rock and slowly put on my flippers. The guide held out his hand to help me into the water. “I’m scared of the sea urchins!” I told him frantically. I thought for a moment. Putting on the wetsuit had been such a struggle that I felt I might as well get in. I also didn’t want to miss out on seeing the marine life. So I put on my mask and got in. The water was clear and calm. I dipped my face into the water and just floated, admiring the tiny fish swimming below me. I could see some sea urchins, but they were on the sandy bottom, where it would be hard to hit their spikes without deliberately diving down. Now I knew what the guide meant when he said I would be able to see them. As I floated in the water, I felt all my worries float away with me. I had finally gotten the hang of breathing through the mask, so I wasn’t swallowing salty water anymore. The guide swam along the group, towing a life preserver. I felt reassured knowing there was one nearby if I needed it. He led us towards a sea turtle, and it was soon joined by two more. It was so amazing to see three large sea turtles swimming directly under me! I kept my legs as still as possible as I admired them so as not to disturb them. They seemed to have no fear of humans. The guide pointed out a marine iguana swimming nearby. It was amusing to watch it swim as it kept its head above the water, only moving its legs and tail. I also spotted some large colourful fish. Before I knew it, our hour of snorkeling time was up and we had to get out of the water. I reluctantly took the sailor’s hand and climbed back onto shore. I had gone from not wanting to get in the water to not wanting to get out! I was so glad I had decided to snorkel despite being afraid of sea urchins. I’ll never forget swimming with such large sea turtles! And it was my first time snorkeling successfully on my own without having to hold onto a guide or life ring. I’ll always remember Isabela Island as the place where I learned to love snorkeling! Read my detailed guide about how to visit the Galapagos Islands without a cruise here. Lovely post. It was great to read about Las Tintoreras and also see your beautiful pictures. I’ve never seen so many iguanas before in one go. I also like the sound of seeing the reef sharks! Thanks for telling us about your experience and also who you went on a tour with. Thank you Mike, I’m glad you like my photos. Yes, it was amazing to see so many iguanas and reef sharks! Galapagos is such a DREAM destination for me! Love your post and all the pictures! I can’t wait to go someday! Hope you get there soon! 🙂 Thanks for reading. That sea lion was adorable!! Which tour did you like better between Los tuneles and Las tintoreras? It’s hard to choose! They are very different tours. If you want to see marine iguanas, you can see huge colonies at Las Tintoreras. 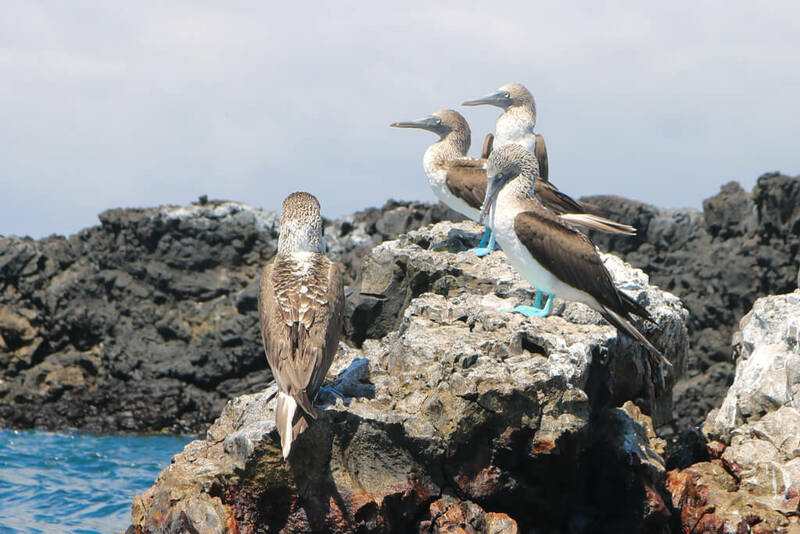 If you want to see blue-footed boobies, Los Tuneles is a better place. I saw penguins (on the rocks) during both tours. The snorkeling at Las Tintoreras was much easier, but I saw less sea life than at Los Tuneles. The lava bridges you will see on the Los Tuneles tour are more interesting, and it is known as the “must-do” tour while on Isabela. So if you only have time for one, choose Los Tuneles.